Onion Pulao is one simple Pulao which can be prepared in just 10mins.It calls for simple ingredients. If we have cooked Basmati rice we can prepare the pulao in no time. This will have a slight sweet taste due to the onion and nuts added. 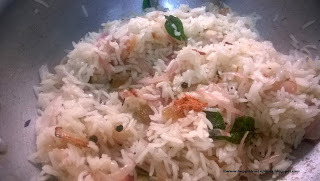 1) Soak Basmati rice in water for about 30 mins. Bring in lot of water to boil and cook the basmati rice. Once cooked strain it and set aside. 2) Take Ghee and oil in a kadai and fry the chopped onions until it caramelizes. Fry the cashew nuts and Raisins also along with the onions. The onion should become golden brown in colour. Remove everything to a plate once it’s done. 3) Now in the same kadai add in the remaining ghee and oil and add mustard seeds ,Pepper Corns and Curry leaves, let in splutter by itself and now add the cooked Basmati Rice in the kadai .Add in Sugar and Salt .Stir well and wait until the sugar caramelizes. It might take about a min.
) 4) Now add in the Fried onions to the kadai and mix well. Also at last add in Cinnamon Powder and mix well and switch off the flame. Tasty Onion Pulao is now ready to be served. The Key taste of this pulao lies in the Caramalization of the onions, so don’t be in a hurry.This might take about 15 mins if done in a slow flame. High flame might burn the onions. You can skip the oil and do the entire process with Ghee .It gives a wonderful aroma to the pulao. Don’t skip the sugar and Cinnamon Powder as it enhances the taste of the pulao. This Onion pulao will be mildly sweet due to the Caramlization of the onion. This Pulao can be prepared very quickly if we have the onions handy. This is a great Lunch box idea. Tastes best when served with any spicy chicken or vegetable Gravy. One super hit easy lunch box receipe.. Totally loved the taste !! Thanks Bala.. Glad you liked it! !